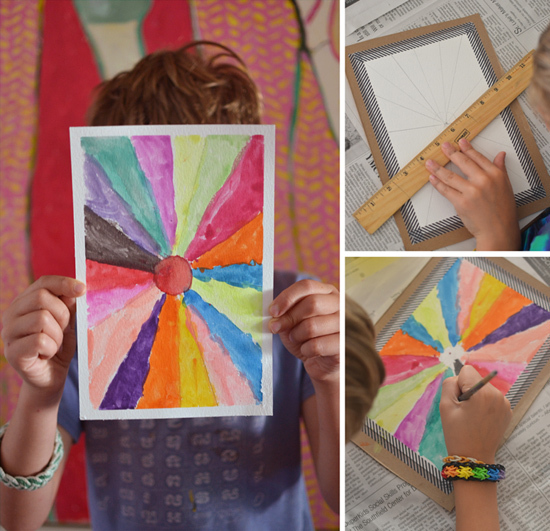 There is something so satisfying about an art project that combines coloring and math. It probably has to do with the whole left brain vs. right brain theory. Artists are usually considered more right brain thinkers, with math being more of a left brain function. But in reality, most people use both sides pretty well. 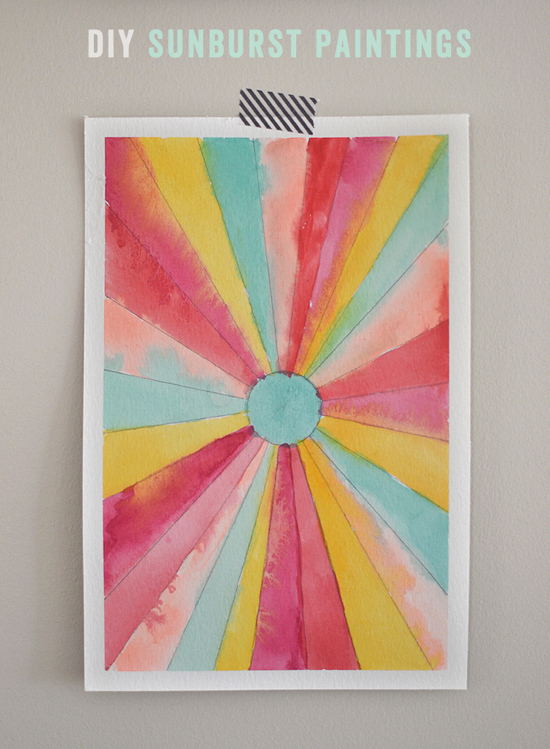 These paintings remind me of my childhood when I used to spend hours coloring in my spirograph coloring book. Even back then I loved a good math/art combo! 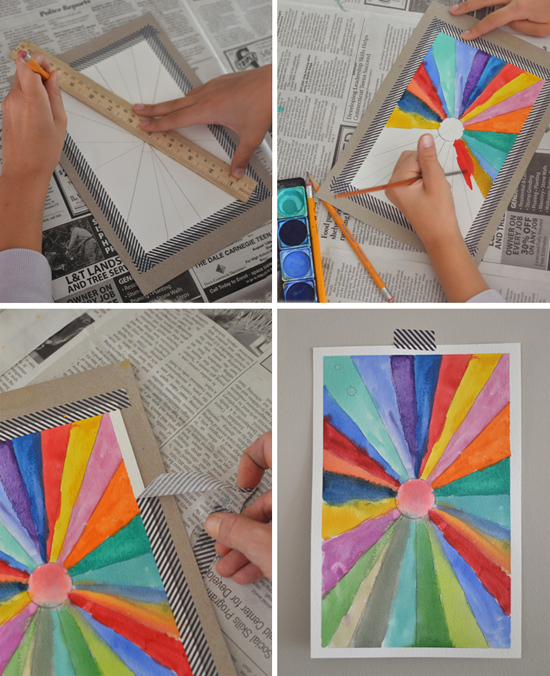 Start by taping your watercolor paper to a piece of cardboard (we used cereal boxes). This will create a nice white border when you are finished. I used washi tape because I didn’t want it to be too sticky…just sticky enough to keep the paint out, but easy to peel off. Next, find the middle of the page with your ruler and mark it with a dot. Take your washi tape, or a small circle object, and draw a ring around the dot (we used the inside circle of the washi tape, about 1.25” diameter). Now have the kids take their ruler and draw lines through the dot. This would be a good time to talk about converging lines! If you have older kids, you can even throw in the word perspective and teach them about points on the horizon. Little kids might need help holding the ruler down and running the pencil along the edge, but they learn quickly and usually they want to do it all by themselves. After they have finished their lines, erase the ones in the circle. Now it’s time to paint, the best part! They don’t have to use watercolors (I just happen to love this medium if you can’t tell). They can use markers, colored pencils or even watercolor pencils. Lastly, when the paintings are dry, you can slowly peel off the tape (another extremely gratifying task). You will be amazed at these beautiful little works of art. 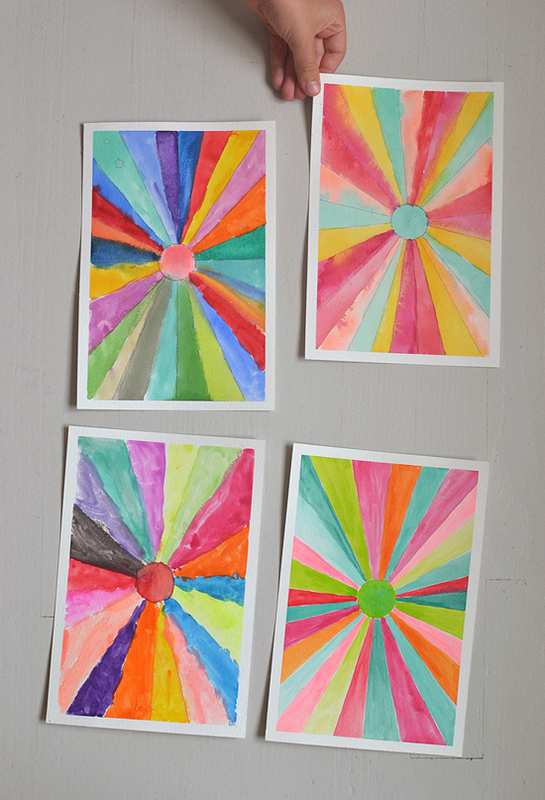 As with most of my art projects, these are just as fun for adults and I encourage you to try. 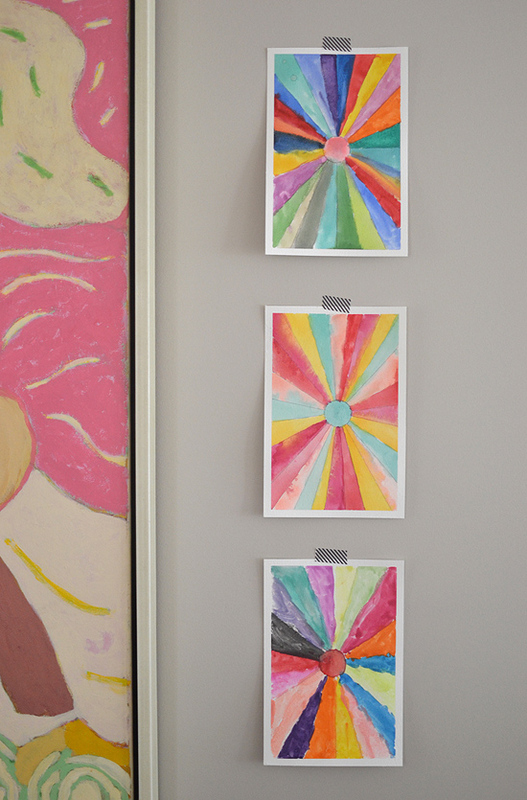 One note from the wise, make your paintings after your kids. They do tend to compare their work with yours, especially if you are good at coloring in the lines. My kids know by now that I will always say perfection in art is boring and that I LOVE when paint is outside of the lines. But they don’t believe me because they are kids and I’m their mom. Someday they will hear my voice in their heads and stop going for perfection (I hope). Have a happy Monday! This is our first day back to school in Connecticut, which is always bittersweet. Summer goes much too fast!! Great project! I used to lead the Art Imagination project at my daughter’s kindergarten class. This would have been a perfect one to do. Change the circle to a heart and BAM! Valentines gift for Gma and Gpa! I was running out of ideas that all my kids will enjoy together including my 9 year old. Hi, Bar, I just discovered this blog. Thank you for the great ideas! And your tips are also very good. I also insist my small kid not to obsess with painting inside the lines. I had so much fun doing this today with my kiddos! Even my three year old was into it. And, of course, I couldn’t let them have all the fun. ;) Thanks for sharing this simple but really pretty art idea! Yay! I love knowing it helped all of you get your creative on! 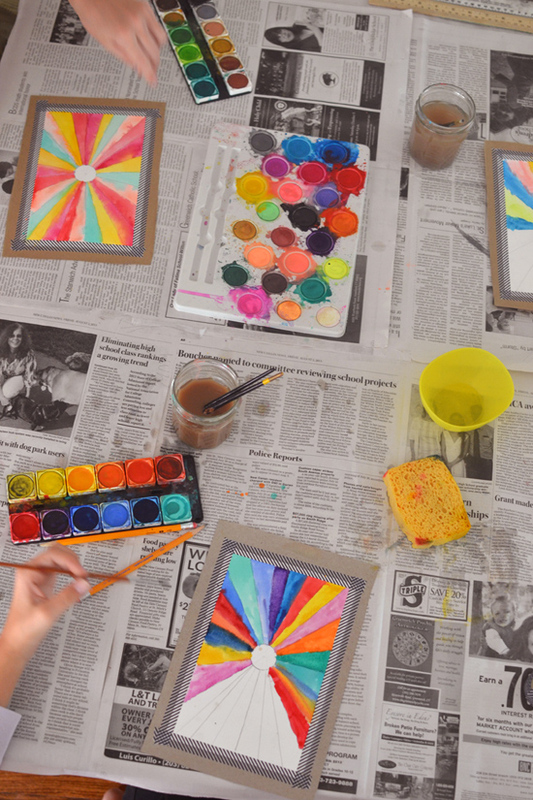 sunburst paintings with some of the 40 kids of our after school care! How do I find the instructions for making the little octagon white box with little Christmas tree cutouts inside? Entry Table – Back-to-School ed. Next post: finally: buy h&m kids clothes online!